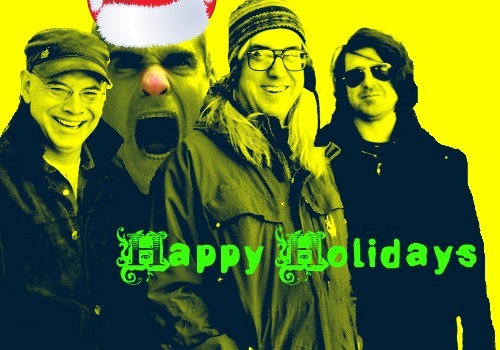 This holiday season, when you’re not hitting up the mall for your girl (or your man), you can instead spend time with the always festive J Mascis. Why? It just so happens Dinosaur Jr. will be coming to your town – well, if you live on the West coast. The Amherst, MA trio has opted to stay with good company over the holiday season, and while they continue to perform their seminal 1988 album Bug in its entirety, they’ll also keep pal Henry Rollins on board, too. For the past few months, the former Black Flag frontman/fictional Los Angeles policeman (um, this?) has been interviewing the band prior to their performance. So, if you’re still questioning whether or not Santa’s coming down from the North Pole, you could always bet on this as a sure thing. And if your loved ones skew more on the alternative side, you might want to ditch the mall, and pre-order some vinyl for ’em. Reissues for Dinosaur Jr.’s first three albums - Dinosaur, Youre Living All Over Me, and Bug – will all be available starting October 4th via Jagjaguwar.